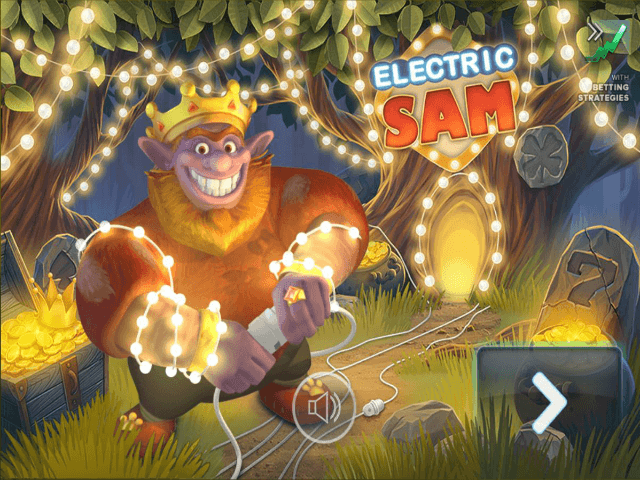 A mysterious troll running his own casino in an enchanted forest may sound like a pretty ‘out there’ narrative on which to base a slot game, but Electric Sam (you might know him from the Sam on the Beach slot game) is surprisingly charming, fun and rewarding. 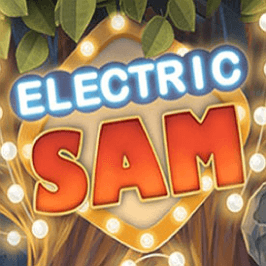 Created by the team at Elk Studios, Electric Sam online slot features a free spins bonus, multipliers of up to 10x and imploding symbols that help to create additional winning combinations. There's plenty for players of all tastes and budgets to enjoy here. What's more, ELK are renowned for the quality of their animations and soundtracks, with Electric Sam no exception to the rule. So the game looks and sounds fantastic, but how well does it play? Play Electric Sam Slot Demo for Free! Play Electric Sam for Real Money! The first thing to note about Electric Sam is that it features ELK’s 243 ways to win system. This means that you aren't targeting specific paylines for your winning combos, but random patterns and shapes instead. You won’t be able to remember them all, but not to worry – each spin of the reels is jam-packed with earning potential. As ever, the objective of the Electric Sam slot is to land three or more matching symbols on one of these patterns for a prize. Sam himself is an old-fashioned sort with a penchant for all-things-retro, which is why these reels are packed with symbols that nod to fruit machines of yesteryear. Think melons, lemons, cherries, lucky number 7s, and more. As well as Sam, you'll meet his wife Sandra and their daughter, Maggie. In addition to paying out the biggest prizes in the main game, these three characters also trigger the game’s ‘electric treats’ which come to life in the free spins feature. 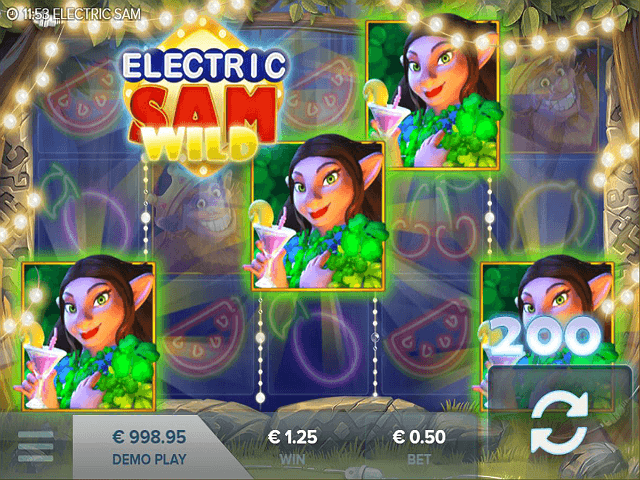 Placing your bets in the Electric Sam online slot is a doddle, and ELK Studios have made it even easier by offering players three distinct betting strategies. There is Raise on Loss, which, as the name suggests, will incrementally increase your stake amount to help cover losses. This occurs four times until you potentially land a winner, at which time it will reset. The Raise on Five Consecutive Losses strategy is self-explanatory, while Raise on Win is a bold tactic that raises your wager amount after each win, up to a maximum of four levels above your original stake. There are two additional symbols in Electric Sam that you'll need to watch out for. 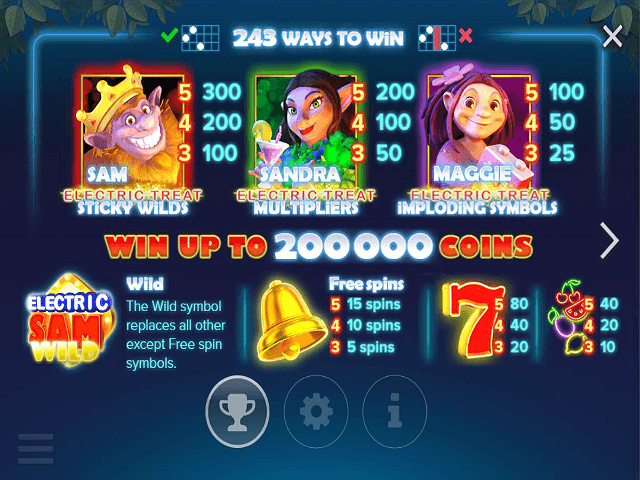 The wild is represented by the Electric Sam logo, and automatically replaces all other symbols (bar the free spins symbol) to treat players to new and exciting winning combinations. The free spins symbol is the golden bell. This has a very simple modus operandi: three bells on your reels earns five free spins, four bells serves up ten freebies and a full set of five rewards you with 15. This free spins feature plays out as normal but with three glittering exceptions. Three or more Sam symbols trigger the sticky wild Electric Treat. Here, one symbol is chosen at random to be replaced by a sticky wild. 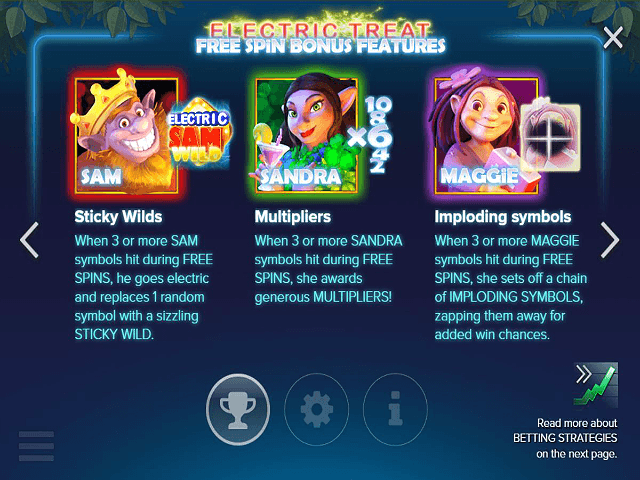 Land three or more of Sandra in this feature and she'll reward you with a handsome multiplier, while Maggie’s Electric Treat is imploding symbols – random icons will be zinged to dust and replaced with new ones, creating hopeful new combinations. Share this Electric Sam Review today! If you like Electric Sam, you'll love these slot titles too!